It’s getting cold here. My jeans are emerging from the depths of my closet, my morning runs are way more pleasant (Under 90 degrees!!! 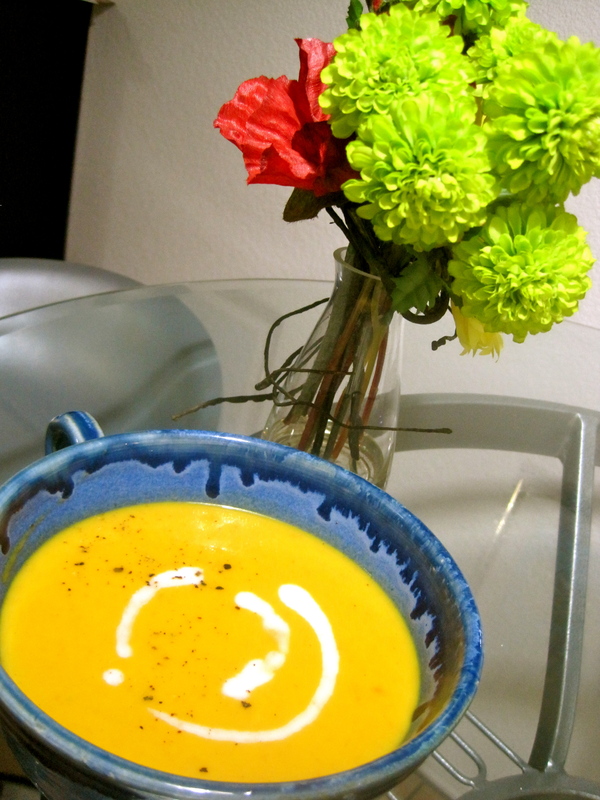 ), my kitchen is filled with many different, glorious soups. I know Fall started for the rest of the world weeks ago, but here in the desert, it’s only just arriving. Because of these insanely cold temperatures (60 degrees!) I find that for practically every meal, I crave soup with toasty dunking bread (unless it’s breakfast, of course). I mentioned before that I really loved soup. I love hearty stews. I love smooth vegetable soups. Soup can be chilled in the summer or hot in the winter. Plus, soup exists in practically every culture. I mean, if most of the world is eating some kind of soup, it must be good right? I found this recipe on one of my favorite blogs that I’ve mentioned many times before, Joy the Baker. It’s an awesome segue soup since it’s a little summery (it’s very light and smooth) and a little fall-y (lots of warm, spicy ginger). I love the complex flavors with the minimal amount of ingredients. And it’s really easy. If I had an emulsion blender (hint, hint… Birthday! ), it would be easier. Coconut is one of my favorite ingredients. It adds a touch of creaminess without being too heavy. 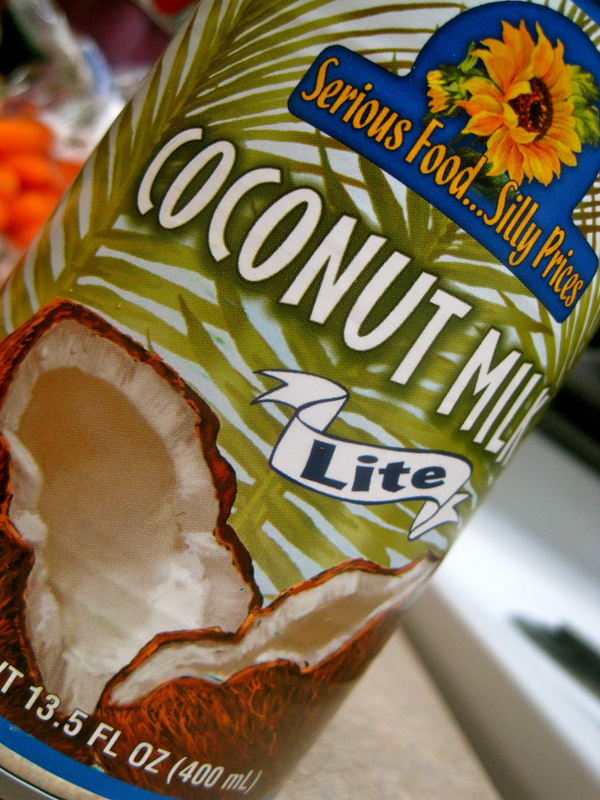 It also has a really nice, subtle coconut flavor that really complements the ginger. 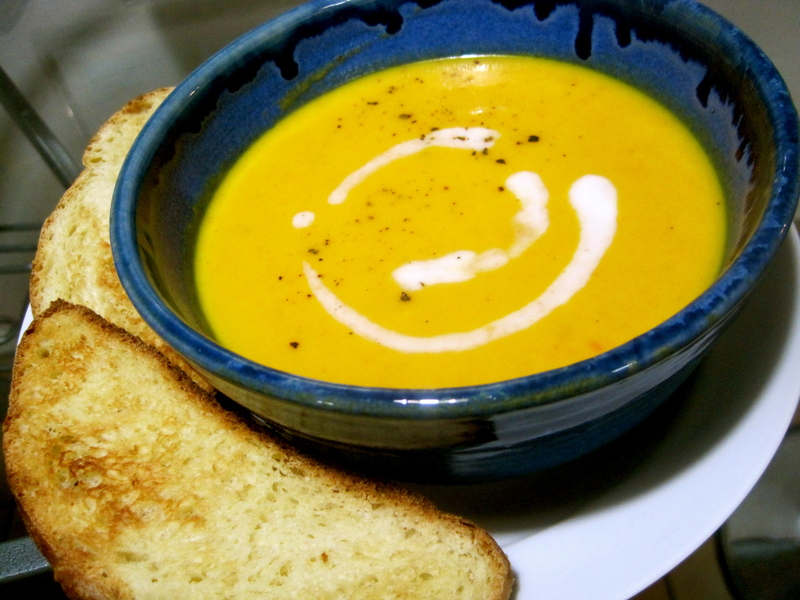 Carrots work so well in this soup because they are sweet, but also earthy. They really give the soup great texture. Plus the the orange color is so festive and fall-y. 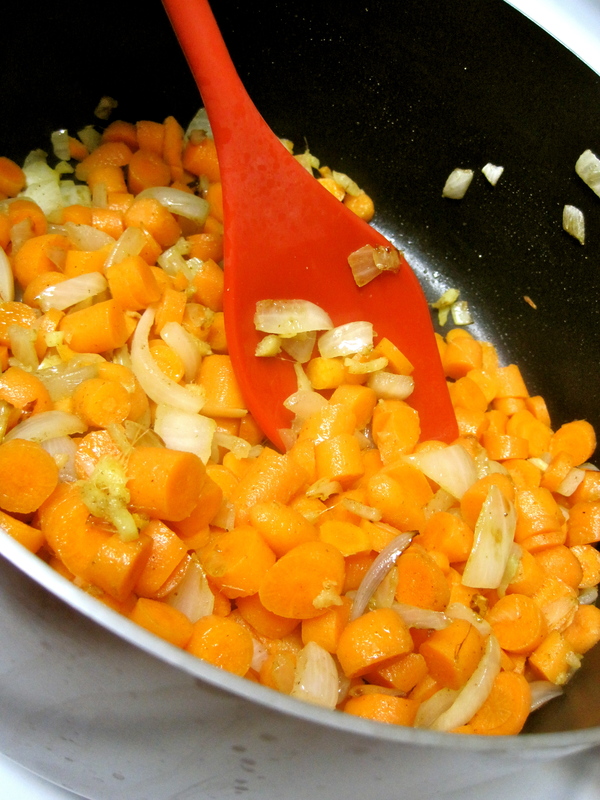 The carrots, onion, garlic, and ginger make magic in the pot. It smells AHHHH-mazing. Once the soup has married together in the pot, it is blended until it’s smooth. I don’t have an emulsion blender (HINT, HINT, HINT…), but if I did, this is where I would use it instead of a Magic Bullet. Magic Bullets are messy when trying to puree soup, just FYI. The coconut milk works in two ways: to make the soup super creamy and delicious, and as a neat garnish on top. If you’d like to do the garnish, get a little coconut milk on a small spoon and slowly drizzle it over the soup. In a large soup pot, heat olive oil over medium-high heat. Add onions and cook until they look translucent, 4-6 minutes. Add ginger and garlic, cooking until fragrant, another 4-6 minutes. 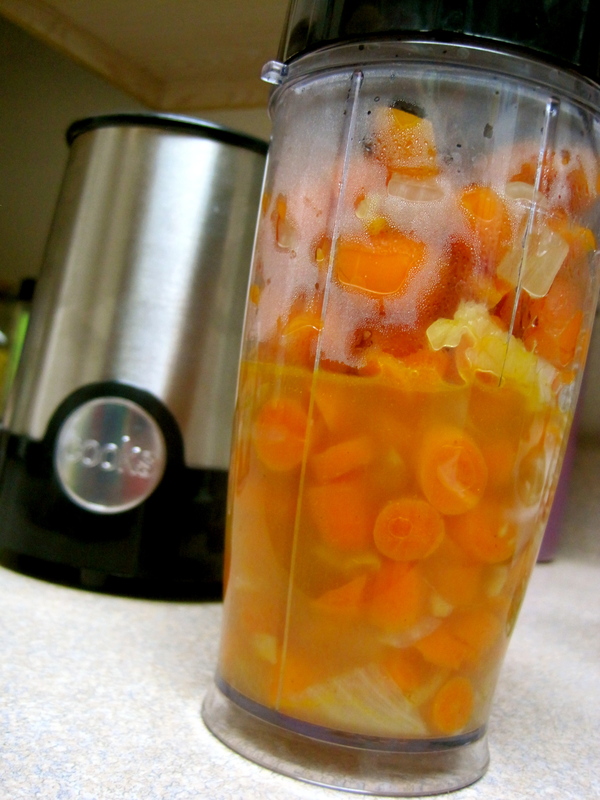 Add coriander and carrots, stirring until completely incorporated. Add broth. 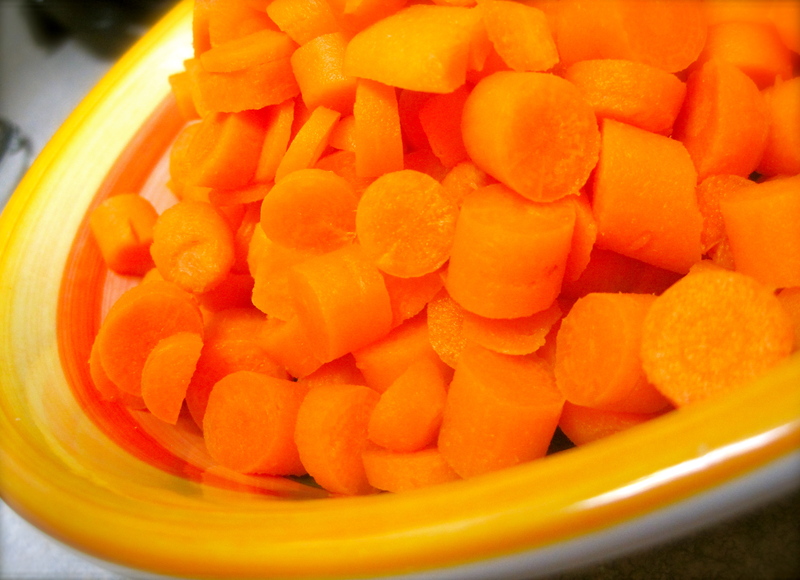 Bring soup to a boil, then reduce to low and cover, letting soup simmer for about 30 minutes, or until carrots are soft. Remove from heat and allow to cool for about 20 minutes. In small batches, puree the soup (with an awesome emulsion blender, if you have one… I don’t) with a blender, food processor, etc. Return pureed soup to the pot and heat on low, without coming to a boil. Add the coconut milk. Salt and pepper to taste. Garnish with fresh cracked pepper and swirls of coconut milk, if desired. Eat with lots warm bread. Next Next post: CookingCollegeChick gets a new look!